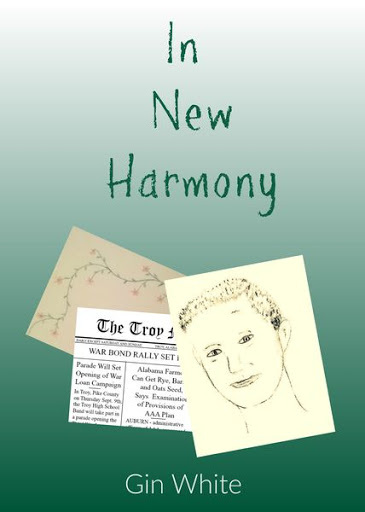 In New Harmony is my middle-grade historical novel… but it didn’t start out as a novel. 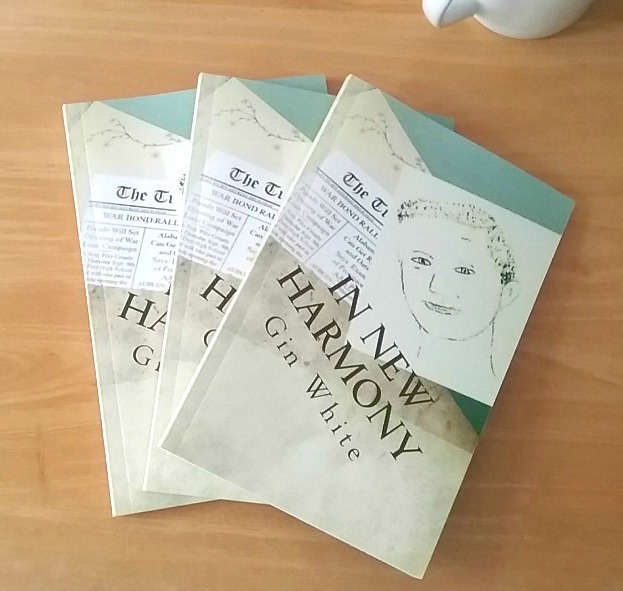 The idea that sparked what was to become In New Harmony was a little memory my mother told me. About a time when she was young, spending the night at a relative’s farm, and she’d been scared by a noise that sounded like someone breathing just outside the open window. I turned her memory into a children’s short story, setting the story in the 1930s, the time-frame it actually happened when my mother was a small child. The title I chose for the short story was “Night Noises” – a title to reflect the differences in the noises the main character (named Bunnie in the story) experienced during her first night on the farm, compared to the noises she was accustomed to hearing at night in her home in Atlanta. Only a few things about “Night Noises” were true-to-life when it came to my mother. Bunnie was one of her childhood nicknames. She had been frightened – and then relieved and laughing – about the noise. But the other details and the rest of the “Night Noises” story? All fiction. Bunnie in “Night Noises” was several years older than my mother had been at the time of this memory. My mother didn’t have a younger sister (her sisters were both older). She never lived in Atlanta and moved from there to a farm – actually, until her early teens, she lived in rural Alabama and her own family farmed a little space of land. I revised “Night Noises” a few times… but then I realized something. The characters wanted to stick around. And the story wanted to become longer – and go deeper. And that’s when Night Noises started to become a novel. I kept the main character at the older age (13) but changed the time of the story to take place in the summer of 1943 – which is when my mother was 13 herself. I changed most of the characters’ names to be different than their names in “Night Noises.” Bunnie turned into Nora, and Ellen turned into June, and Uncle John turned into Uncle Lester. World War II became integral to the storyline, and I added the important-to-the-novel detail of an older brother who had recently been killed in battle. And although I don’t think the word depression is ever mentioned in the novel, I added the element of Nora’s mother being deeply depressed due to her son’s death. The story of Nora’s mother – and how Nora is impacted by and deals with her mother’s depression – is a central part of the story that became In New Harmony. But in one way, Nora’s story is the opposite of my mother’s life. One big reason Nora and her family move to her uncle’s farm is to help out… because hiring people to help during the summer and the harvest season had become difficult. This happened because so many were now in the Army or Navy, or had moved away to work at factories necessary for the war-time effort. For my mother’s family, this shortage of potential farm helpers was the reason they moved away from rural Alabama. Even though their house was small and their plot of field wasn’t much (my grandparents were the opposite of wealthy farmers with lots of land), my grandfather needed extra help during certain times of the year when it came to farming. More help than what he, my grandmother, and their three daughters could do by themselves. 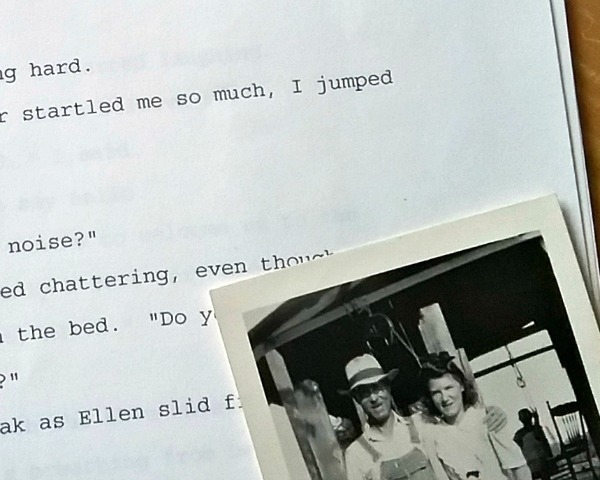 So, when my mother was Nora’s age – or a bit older – she and her family left farming and rural Alabama. They didn’t move to Nora’s hometown of Atlanta, but they did move to Georgia. They settled in a town – small compared to Atlanta in 1943 – but it wasn’t a rural location, and it was a town much larger than where they’d lived. But although my mother’s move was almost the exact opposite of Nora’s, her experience of why her family moved was a big spark for part of the storyline for In New Harmony. Some bits of the original “Night Noises” short story can still be seen in what eventually became the middle-grade novel, In New Harmony – but In New Harmony developed into quite a different story. And ultimately, a story about love, getting through tough times, and starting anew.